A new slate of cast members began spreading magic across Broadway in Harry Potter and the Cursed Child on March 20. The fresh group of stars joined the Tony-winning two-part play upon the anniversary of its first performance at the Lyric Theatre. New principal cast members include James Snyder as Harry Potter, Diane Davis as Ginny Potter, Nicholas Podany as Albus Potter, Jenny Jules as Hermione Granger, Jonno Roberts as Draco Malfoy, Bubba Weiler as Scorpius Malfoy, Matt Mueller as Ron Weasley and Nadia Brown as Rose Granger-Weasley. 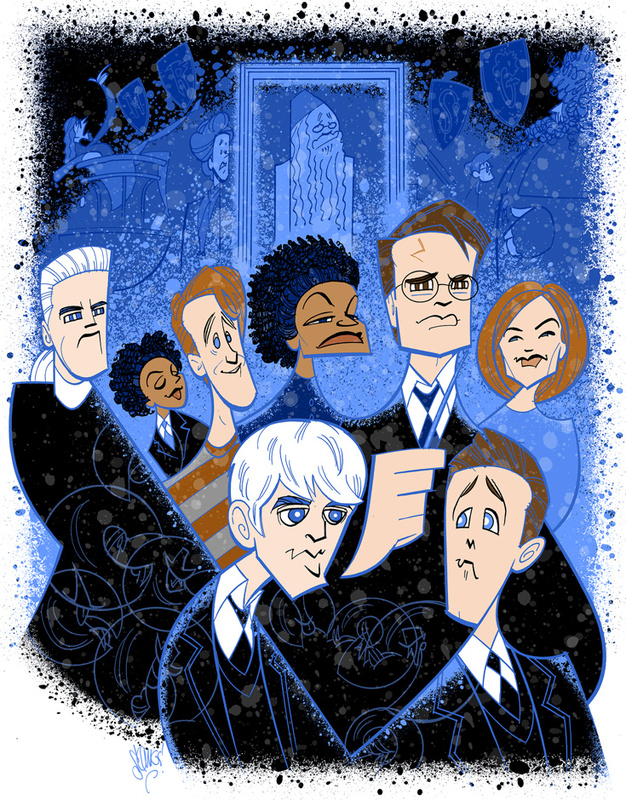 In commemoration of the new cast and the play's first anniversary, Broadway.com Resident Artist Justin "Squigs" Robertson sketched a portrait featuring Snyder and his co-stars telling the epic next chapter in a beloved tale for Broadway audiences.